I’ve been thinking about the transit expansion plan for Nashville for a while now and even made this network and density map a few weeks ago but hadn’t written about it yet. I think it was partly to see what happened and also what more opposition would say and how they’d be rebuffed. Each week we write a piece with the most interesting articles of the week for Greater Greater Washington and syndicate it to Urban Milwaukee and Streets.mn. We take the most clicked posts of the week from The Overhead Wire daily and write about the most interesting ones. Follow beyond the crease to read up on this week’s most interesting pieces. I’ve been meaning to post about Amazon but there’s been so many great pieces out there from every publication. I am not sure if I can do any of it justice with limited time but maybe I’ll try and make some maps of Dallas and Denver soon which I think have the upper hand based on quality of life and transportation access. The digital ink is pouring out over what can be done about the flood damage resulting from more frequent rain events. And amid that chatter I probably should reiterate that perhaps not much can be done about 30-50 inches of rain in a few days, a number larger that even the wettest state’s annual rainfall numbers. But even writing that sentence worries me for a different reason. My biggest worry from this result will be that people will write it off as a freak accident, a once in a million occurrence that isn’t likely to happen again. But if I’m reading the news correctly on Houston, three 500 year storms in three years means something definitely needs to be done to make sure that water isn’t a recurring threat. And let’s also be honest about something else. This incidence of more storms isn’t just happening in the United States as climate change knows no boundaries. Just ask Nigeria and Bangladesh whose coverage has likely been overshadowed by Harvey’s coverage. Note: If you can, give a bit of support to the folks in Houston. I would recommend the Red Cross. I woke up this morning to the devastating news about Hurricane Harvey and the pummeling that Houston is taking from mother nature. As a native Houstonian (annexation counts right?) we grew up with the threat of hurricanes and floods, the closest to me personally coming in 1994 when 20-30 inches of water dropped in a few days and led to a lot of homes in my part of the city getting flooded including those of close family friends. So this morning on twitter Pro Publica, which wrote an amazing piece with the Texas Tribune recently about the dangers of potential flooding in Texas, was writing a twitter thread on the subject but said something rather odd. They blamed a lot of things but one of them was Houston’s lack of zoning, saying how it caused a push for more sprawl. 3/ Climate change plays a role. So does Houston’s utter lack lack of zoning, and relentless development in flood-prone areas. Folks that read this blog probably know that Houston lacks “zoning” BUT it still has everything bad you need for zoning in the development code, it’s just not use based. I got an email from a colleague today asking me if there was “a national standard for transit frequency ranges”. Off the top of my head I wasn’t sure, though I know 15 minute headways are generally seen as “frequent” when it comes to the new mapping standard. So I did a bit of digging and found a paper from the Transportation Research Board. I skimmed through and as I was looking at some of the charts stumbled upon the exact answer I was looking for…a short simple chart that laid out a pretty simple frequency standard for urban service. Each day for The Overhead Wire I put together a list of the articles I think are most interesting about transportation and urban planning in cities. It usually takes me about six hours to put these together, first searching for articles through methods I’ve developed over the last ten years, sorting them based on topics, then sending them to an intern who tags each piece in our database with topic and place tags. 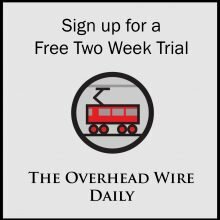 This process takes a lot of time and effort and up until now readers have been able to get access through The Overhead Wire website and the RSS feed for free. But ultimately that isn’t sustainable going forward for website or me personally. The subscription model has been great thus far for the email service but in order to build towards a longer term goal of more original deep reporting and multimedia such as videos and podcasts the subscriber base needs to grow. It’s for these reasons that I’ll be doing two things; putting up a paywall on the site for the news collection and archive search function and changing the name of the newsletter and site to The Overhead Wire. Original blog posts will remain available on the site. The Blogger site where The Overhead Wire originated will be an archive of past posts and the new site will be the new place for news and analysis in addition to collected articles. Even long time readers and supporters have been confused about the difference between The Overhead Wire and The Overhead Wire so I’m consolidating to The Overhead Wire alone. I’m making this decision to support the long term sustainability of this work. And that’s where I need your help. 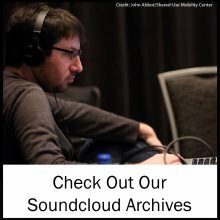 In order to continue sharing the amazing things that are going on in cities around the world and create a better searchable link database while moving towards hiring writers to cover original topics, I’d love for you all who have been reading The Overhead Wire site and the RSS feed to sign up. By subscribing you’ll have access to the articles on the website, the archive of tagged items now numbering over 38,000, and the new RSS feed. You also deserve the same 20% discount I’ve extended to all long term readers who have been with me since the start. Thank you all for being such loyal friends and readers. Together I hope we can build something amazing and that you’ll play an integral part. For the discount, use the code “Transition” for the annual or monthly membership. Thanks for keeping up with The Overhead Wire and The Overhead Wire in your RSS feeds or by checking back in to the website. Many of you are using the RSS instead of getting the daily email and that’s awesome. 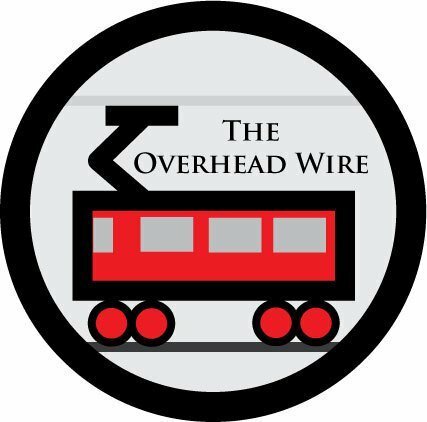 As many of you know, for nine years I’ve put together The Overhead Wire Daily (formerly The Other Side of the Tracks) and for the last few months (and a year+ with Tanya Snyder) have been doing the Talking Headways Podcast at StreetsblogUSA. In my previous job there was a bit of support for these projects however now that I’m working on my own as a consultant that isn’t as sustainable. It probably wasn’t sustainable before but I love doing it and still do. 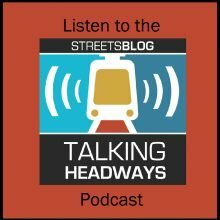 I’d like to keep collecting news and podcasting to share information with folks who love cities. Hopefully I can also write more at The Overhead Wire and here. My intern Kelly has been loading news and writing posts and I need to keep paying her for that great work and pay for some of my time creating these resources. So if you’re so inclined I would really appreciate your support. The Patreon is a monthly subscription donation that you choose. It can range from cents to $150 a month. That higher level will allow someone to co-host the podcast with me once a year. $2 a month gets you a sticker with our loveable Overhead Wire logo on it. 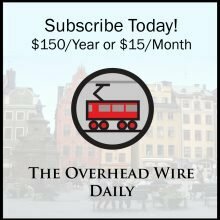 You can support The Overhead Wire on Patreon here. Folks have also been asking if they can give one time. I’m more than happy to have your support that way too. You can click on the PayPal Link Below. So let’s keep this going. Thanks so much for continued reading of our link collections and listening to the podcast. We really appreciate it and I hope they help you as well. The Next Big Tech Hub? With the tech-driven growth that many places have seen, cities all over the US are trying to become the next big tech hub. Cities are trying to woo developers, incentivize start-up development, or become the next city with Google Fiber. However, Chattanooga, with its superfast fiber-optic broadband network, knows that high speed Internet isn’t the only thing that’s needed to attract tech companies. They’ve already seen economic growth from the higher broadband speeds, but they’re also trying to increase density and strategize ways to continue growing sustainably by diversifying development. But while other cities strive to attract large tech companies, Mountain View is growing wary of them. Recently, the city denied a Google plan to build its new headquarters there, despite Google offering $240 million in community benefits for the development rights. Instead, Mountain View awarded LinkedIn the rights to develop in North Bayshore, in order to avoid becoming dependent on one big company. There is some reason to their fears. Silicon Valley’s rapid growth has transformed nearby cities, and it’s spilling over. Demand for housing is high, and it’s driving up rents. The existing infrastructure is nowhere near sufficient to handle the volume of users, resulting in traffic congestion and constant transit woes. Bay Area cities have grown rapidly, and there is definite backlash. Even cities in the East Bay have seen dramatic and rapid development. Many cities located near BART stations have seen an influx of housing and retail development. One developer, Lennar, is counting on the continued spillover of tech workers into neighboring cities. They’ve bought an 11-acre chunk of land in Fremont that they intend to develop into 2200 houses, apartments and offices. This is in addition to two other large housing developments that Lennar is intending to build in San Francisco. Other developers have followed suit and bought parcels of land, albeit smaller. While these developments will take over a decade to complete, demand is high, and still growing. But as our population ages, what exactly can we do to improve the livability for seniors? For cities like Philadelphia, where one in seven people is over 65, the problem will have to be dealt with sooner rather than later. While the US tends to focus on Social Security and Medicare as big issues for the elderly, one of the biggest problems seniors face is the lack of affordable and accessible housing. Philadelphia has adopted zoning changes so that accessory dwelling units are easier to build. These units can allow the elderly to live in the accessory units while renting out their home for extra income, or letting their family live in their home as caregivers. Another phenomenon occurring in cities where the elderly population is growing is NORCs, or naturally occurring retirement communities. In some neighborhoods, the senior population may have strong ties to the community and attachment to their homes. As a result, they tend to stay in place rather than move to a smaller home in a better climate, and the community will have a higher number of senior citizens. As communities like this occur more often, the neighborhoods will have to change to adapt to the needs of its residents: better transit, accessible buildings, and pedestrian-friendly streets. The AARP recently created a livability index that may help measure a community’s suitability for seniors. The index scores neighborhoods in seven different categories on a scale from 1 to 100: housing, transportation, environment, health, engagement, opportunity, and neighborhood. It’s not perfect, but it may help cities improve in areas where they are lacking, and become more livable for their elderly residents. To improve the livability of neighborhoods, cities often turn to methods like building bike and pedestrian infrastructure or adding trees. However, one of the easiest and most affordable ways to improve cities might be to simply get rid of one-way streets. One-way streets became prevalent when cars were being introduced to the American public, as they were better suited to the higher speeds. A car would be able to travel faster along a wide one-way than a similarly wide two-way. But one-way streets might have done American cities more harm than good. A study of 190 neighborhoods in Louisville shows that the risk of collision and injury in areas with many one-ways is about double that of areas with only two-way streets. Cyclists and pedestrians are also more likely to get injured on one-way streets. Not only that, property values in neighborhoods with one-way streets tend be lower–on average, they were half of what homes were worth in neighborhoods that didn’t have one-ways. One way streets don’t only have higher rates of collisions and injury, they also seem to come with higher rates of crime and neglect. Streets that were converted into one-ways in the 1950s and 1960s seem to have deteriorated more so than two-way streets. It’s far easier to keep an eye out for law enforcement or flee on one-way streets. And because two-way streets are less conducive to high speeds, it is more likely that people passing by would see if a crime was taking place, making one-ways more desirable for breaking the law. Of course, similar effects could also possibly be created on one-way streets. If the main cause of two-way streets being safer and less crime-ridden is slower speeds, then perhaps one-way streets can be made just as safe using traffic-calming methods. There’s a new private service in San Francisco offering luxury bus rides to downtown from a few select neighborhoods. For $6 each way, Leap buses have free wifi, usb ports, and sell coffee and fresh juice on board during commutes. Leap is just one of a slew of new startups that are providing luxury or private transit services in the context of San Francisco’s often overcrowded and less than stellar public transit. Muni has been struggling to keep up with its ridership for awhile, and recently announced a plan to improve its service. Under the plan, Muni’s service hours will increase by 2.5%. The bus shelters will receive slight improvements, like better maps, solar-powered lights that will glow even when it’s foggy, and bike racks. Muni will also try to meet service standards with more regularity. These upgrades are much needed and long awaited, but whether or not they will result in meaningful improvement to Muni has yet to be seen. In the meantime, services like Leap are trying to corner a sector of the market that public transit just isn’t satisfying. Although Leap may reek of elitism, it is also shaking up transit industry and may drive the public sector to improve. Companies like Leap are much more flexible and experimental than public transit, and as a result, are the ones driving innovation in transit. One great feature of Leap, for instance, is that riders can pay using their smartphones or even check in via bluetooth so that they don’t even have to touch their phones. Riders can also check their phones to know how far away the bus is and how many seats are left. Yet Leap Transit doesn’t seem to have taken off so far. The bus, which currently only serves the Marina District and North Pacific Heights, runs in the morning and takes passengers downtown, and then back to the neighborhoods in the evening. While the interior is fashionable and the service feels exclusive, the bar seating doesn’t seem very practical, and ridership seems low so far. It’s questionable whether the company will make it, but there’s no doubt that the public sector can learn some valuable lessons from it. For those who are fans of the SimCity games, there’s a new game that’s taken the city building genre by storm. Cities: Skylines, by the Finnish game development company Colossal Order, was released last month, and it’s quickly become one of the top city building games. While there’s nothing in particular that’s is completely new or innovative about the game, it is rigorous in modelling all the traditional parts of city building simulations, a welcome change as the SimCity franchise has moved its focus towards the social engineering aspect of the game instead of the actual city building simulation. Similar to SimCity, the player acts as mayor and builds a city by zoning land, building infrastructure, and developing public spaces like parks and schools. However, one of the biggest differences between Cities: Skylines and SimCity is that Cities: Skylines is far more robust in its modelling of transit. The game’s developers also built the transit simulation game Cities In Motion, and as a result, this game’s spectrum of transit options is much fuller: you’re able to draw bus and rail lines on top of just designating bus stops, as well as set overall service levels. On top of being an entertaining game to play, Cities: Skylines can also be a fun way to understand urban and transportation issues. One of the greatest criticisms of the SimCity games was that it was a good game for building sprawled cities, but the lack of transit options made it impossible to model denser cities that rely on public transit. This game allows for the simulation of many more city archetypes. As you develop these cities, different issues may arise: traffic congestion, pollution, and most importantly, you’re able to see how your city’s budget holds up and its cost efficiency per citizen. Egypt’s housing minister Mostafa Madbouly has announced a plan to build a completely new capital city, possibly as soon as within seven years. Cairo, which has a population of 20 million residents and is expected to continue growing, is overpopulated and polluted. The new city is expected to help alleviate some of that congestion and modernize Egypt’s capital. Unsurprisingly, this plan has been met with plenty of doubt. Egypt has built several “satellite” cities for Cairo in the past in an attempt to reduce congestion, but many of these cities now lay desolate. If that’s the case, how can a new capital city hope to attract the urban population of Cairo, which has over 1000 years of history? The plan itself is ambitious, grand, and big. The new capital city is expected to house five million residents over 270 square miles of land, with 663 health centers, 1,250 mosques and churches, and 1.1 million homes. Taking notes from more successful purpose-built cities, the new capital will consist of mixed-use development, be connected to transit, and have plenty of green space. Madbouly believes that 1.5 million jobs will be created, and generate enough economic incentive for locals to move into the city. While planned cities have a bad reputation today, there are a few success stories, such as Brasilia. But some have a much darker view of the plan. Egypt’s government, which rules by an authoritarian military regime, does not necessarily serve its people, and this new capital city is just as likely to be a tool for control as it is a solution to Cairo’s urban issues. Cities can be designed to make it easier for the military to quell riots and keep the poor out of sight. Not only that, this new city will be a monument to president Abdel Fatah al-Sis and his new vision for the country as well as help distance himself from Tahrir Square, where his past two predecessors were overthrown. Cities are adding bicycle lanes to streets with heavy bike traffic as a means of improving safety, but the process is constantly being hindered by strong opposition from the businesses along the streets where the lanes are proposed. Most small businesses with street parking spots are reluctant to give them up for parking lanes out of fear that decreased parking space will affect their business. This was recently highlighted in San Francisco, when bike lanes were proposed for Polk Street. Though Polk was considered one of the most dangerous streets in the city for cyclists and pedestrians, the plan to add a bike lane faced heavy backlash from local merchants, and as a result, took over 2 years to implement. The backlash from local merchants provoked enough contention in bike advocates that some started a Yelp campaign against an optometrist who lobbied the mayor to remove his block from the Polk Street bike lane plan. However, the fears of bike lanes damaging local business are unfounded. In fact, many studies show that rather than decreasing business, increased bike traffic actually seems to promote more spending. While people in cars tend to spend more money per shopping trip, people on bikes tend to take more trips and will ultimately spend more. This has been seen in cities throughout the US and internationally, so any opposition to bike lanes based on negative economic impacts have yet to be justified. Bike lanes aren’t the only use for parking spots that can be good for business. Parklets are popping up in front of stores and restaurants in many cities, and they too, can increase sales for nearby businesses. Parklets take up only one or two parking spots, but their occupancy rate and turnover are far higher than a parking spot. As a result, places that install parklets often find that the extra activity promotes extra business. The US continued its trend of increasing transit ridership last year, despite the dramatic drop in gas prices. While numbers varied widely across cities, the total number of transit trips in the country increased by 1% relative to 2013. Some of the increases in ridership were attributed to growths in transit service, while others were a result of economic growth. Interestingly enough, most of the national growth in heavy rail transit ridership can actually be ascribed to one city: New York. New York City makes up about one-fourth of all transit ridership in the US, so any changes there will have a significant effect on the overall numbers. As mass transit continues to grow, one of the most useful tools to riders will undoubtedly be accurate, real-time information about their buses or trains. In fact, a study of New York’s Bus Time program, which provides real time bus tracking, found that ridership grew by about 2% on busy routes in the boroughs where the program was launched in 2011. A study done in Chicago found similar results, with ridership increasing about 2% for buses where a real-time information system was implemented. These are promising results for real-time tracking programs, but unfortunately, many of such systems in the US are often inaccurate, or broken. On Monday, Google and Trimet rolled out a wireless train arrival beacon in Portland for the MAX light rail. The beacon connects to bluetooth-enabled Android phones and sends automatic notifications to riders at the MAX station. Whether the beacon will be a success will have to be seen: the service is not available for ios, and currently only works with Android 5.0 or newer. Riders can also access their train info online, so it’s uncertain if having an extra notification when they are already at the station will be worthwhile. Nonetheless, as public transit grows in the US, it’ll be important to expand and improve our current systems of tracking arrivals.